Tan-Sai. Hello everyone. Hi everyone. I’m Robert Bonner. I am Cree from Manitoba. I work with the Carnegie Community Action Project. We work to get better housing and incomes in this neighbourhood and to stop gentrification. 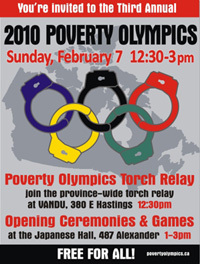 We are part of Raise the Rates, a BC wide coalition who sponsor our Poverty Olympics. I would like to acknowledge the Coast Salish People, The Burrard, Musqueam, Gitxsan and Squamish Nations for allowing me to live and do my work on this land. Miiquitch. I want to welcome you to our DTES. We care a lot about each other here and strive to improve things for all. I also want to say that this Poverty Olympics is dedicated to the memory of two volunteers from last year’s Poverty Olympians who passed away last year: Bingo and Hal Asham. Our whole community mourns them. And in the 90s we fought for our missing and murdered women and for our safe injection site. Now we’re fighting for better housing, better incomes and to stop gentrification. I’m going to take about 3 minutes to tell you why we are having our third annual Poverty Olympics. Canada is a very rich country—rich in land that was stolen from aboriginal people; rich in money and assets. Canadians had almost $5 TRILLON in personal wealth when the last wealth survey was done in 2005. But you wouldn’t know it to look at our neighbourhood, the Downtown Eastside. the lowest minimum wage and highest cost of living in Canada. And here in Canada, this very wealthy country, poverty has about twice the impact as all cancers combined on lost years of life and healthy living!! If you’re poor you have about ten fewer years of healthy living than if you’re rich! And even though the colonial system has made my people the poorest in Canada, the Canadian government refused to sign the United Nations Declaration on the Rights of Indigenous Peoples. Here in the DTES people sleep in doorways, crowd into First United Church to sleep on hard pews and floors; sleep in the crummiest housing in Canada along with bedbugs, cockroaches and rodents. Spending $178 million for a skating oval isn’t very impressive when you’re sleeping in a doorway. That money could build 890 brand new desperately needed apartments. Spending nearly one billion for a highway to open up real estate profits between here and beyond Whistler could build 5000 units of social housing, almost what we need in the DTES. What do the Olympics mean for us in the Downtown Eastside? Evicted by high rents in hotels as developers use the Olympics to speed up the gentrification of the DTES into a condo paradise. What could the government do if it weren’t spending billions on the Olympics? It could virtually end poverty and homelessness. End poverty. It’s not a Game. That’s what we say. So… Canadian governments, take note, people around the world are watching you. There is a movement growing here and around the world for justice. You know when regular folks like us start making bedbug costumes and organizing a province wide Poverty Olympics torch relay that something really important is happening! Welcome to the Poverty Olympics. Let the real Olympics, the Poverty Olympics, begin!